Ontario Southland is an independent, locally-owned Canadian company. Commencing in April 1994, Ontario Southland took over switching from CP and CN of the Petro Canada plant in Clarkson, (Mississauga) Ontario, located on the Canadian National Oakville Subdivision, a Joint Section also used by Canadian Pacific. Operations began using former TH&B 51 an upgraded EMD NW2. The contract was renewed until April 2008.
the city of Guelph, it is one of the very few municipally-owned railways in Canada. Under OSR traffic has grown considerably. Later, OSR took over operation of the CPR's Port Burwell Subdivision and later still CPR's St.Thomas Subdivision to which the Port Burwell line connects. Operations were further expanded with take over of CN's switching for the CAMI automotive plant in Ingersoll. OSR had already been doing CPR's switching with its lease of the St.Thomas Sub. Below these recent photos are a number of sub-articles covering the various operations. BE SURE to click on link in title at top of each section to see and read everything. 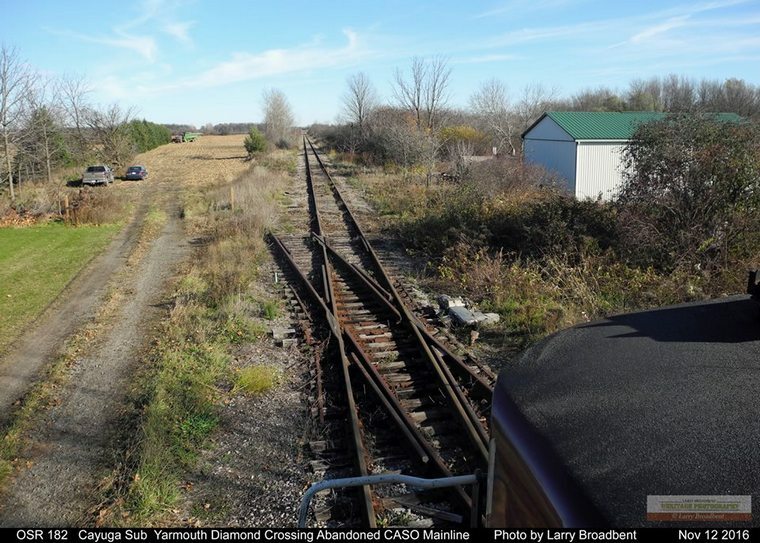 as the CN Cayuga spur between St. Thomas-Aylmer-Tillsonburg-Delhi a distance of just 38 miles. adequate money to accomplish this work. OSR has provided some freight service to Tillsonburg and Courtland on an as required basis through a temporary arrangement with CN. Repairs were undertaken during 2016 on track and the biggest trestle Mile 94.6 at Tillsonburg now completed which will end detouring of CN's traffic by OSR via Ingersoll. A permanent solution with a lease agreement is expected soon between CN and OSR. Mile 115.2 Cayuga spur at the abandoned CASO diamond east of Yarmouth Centre Road. 182-1401 eastbound with train of empty tank cars being relocated for storage. Trestle Mile 113.2 just east of New Sarum. This was NOT the bridge requiring major repairs that closed the line. History and Photography of Individual Lines. January 1, 2018 marked the twentieth anniversary of Ontario Southland's operation of Guelph Junction Railway. 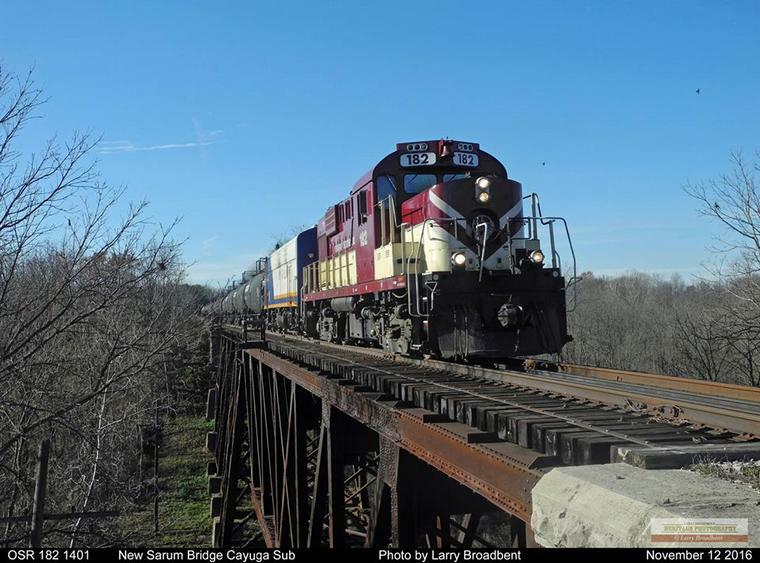 Completion of 2017 saw a record number of 4,809 carloads handled, up 31% over 2016. A net profit of almost one million dollars ($958,000) resulted. This in turn resulted in payment of a dividend for the first time in those 20 years. $100,000 was paid to its sole owner, the City of Guelph. OSR's contract was renewed once again, this time for 3 years with a 2 year option. In recent years GJR has been responsible for all track, signal and structure maintenance contracting it out separately. 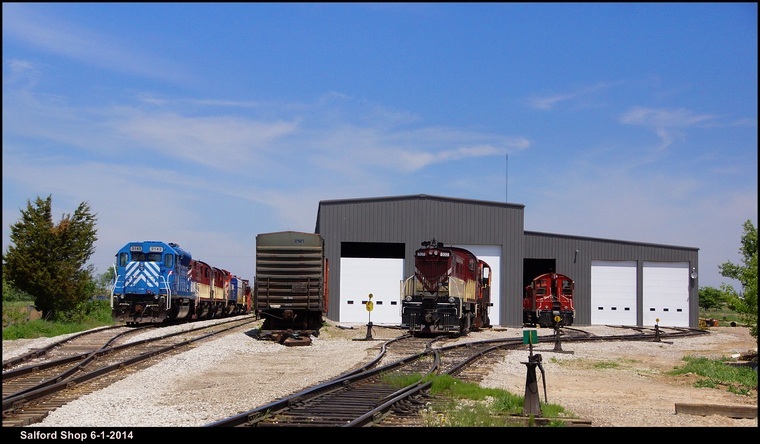 This success was due to OSR's excellent customer service along with the City's dedication to providing rail service to its existing industries as well as attracting new and expanding businesses to Guelph. Key to this success is access to both major railways to get competitive service and freight rates. A major expansion resulted from a unique opportunity when OSR took over the long-invisible Guelph Junction Railway owned by the City of Guelph and long leased to the Canadian Pacific Railway. When declining traffic caused the CPR to give up its lease Ontario Southland stepped in effective January 1, 1998 and they have not looked back since expanding operation and growing business with excellent service. An important missing link was completed when a short piece of the CPR Goderich Sub. 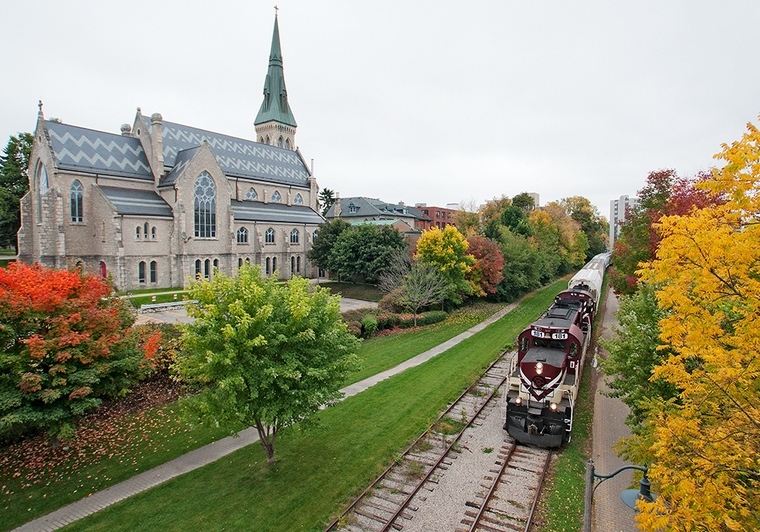 was purchased by Guelph ensuring a connection to the City of Guelph jount switching industrial area in the northwest part of the city also served by Goderich and Exeter a shortline operating the Canadian National main line through Guelph. This resulted in far more competitive service and business has grown substantially. Note: Tillsonburg. 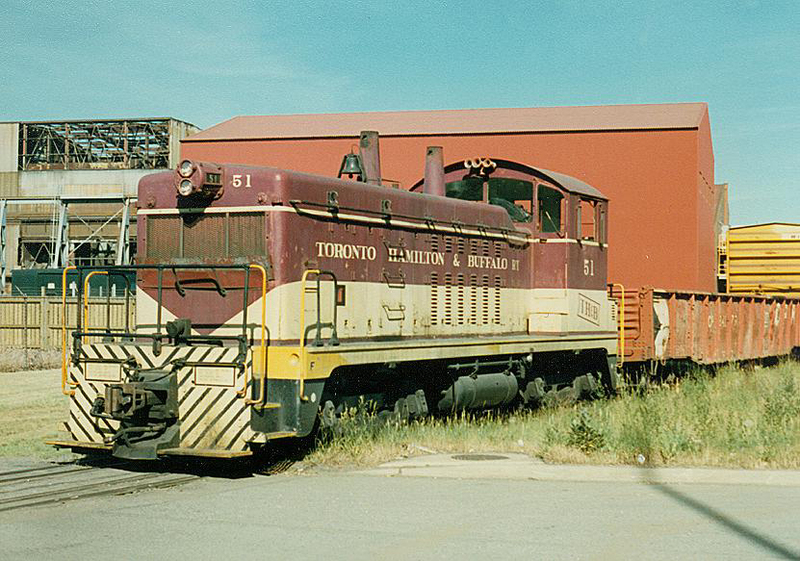 Added photo of abandoned CNR Burford Sub. under abandoned CASO. Also, photo of Tillsonburg North Yard. Salford diesel shop. Stored power in new siding at far left. Shown expanded to right. A further expansion came about when the CPR decided to shortline its Port Burwell Subdivision between Ingersoll and Tillsonburg. 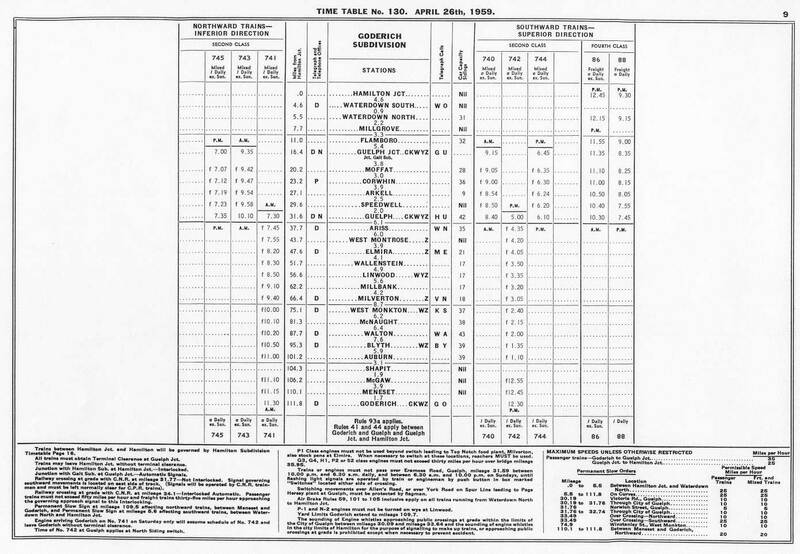 The line had been abandoned December 25, 1987 beyond to Port Burwell. This line connects with the CPR St.Thomas Subdivision at Ingersoll which leads to Woodstock where it connects with the CPR Galt Subdivision main line. OSR leased the line effective February 26, 1998. OSR built a small diesel shop at Salford where a welcoming township smoothed the way with lower taxes than elsewhere. A new customer Future Transfer relocated to Tillsonburg with a transload facility to expand its trucking operation. Unfortunately OSR was unable to secure sufficient land on their line resulting in them establishing their facility on the CNR Cayuga Subdivision which had been shortlined and was operated by Trillium Railway subsidiary St.Thomas and Eastern Ry. However OSR had an interchange with ST&E which permitted CPR and CNR traffic to reach any customer. Safety Klean established a facility to handle used motor oil and other products providing loads in and loads out. Future Transfer established a second facility on the OSR which resulted in relocation of much of the traffic to this location. A major expansion came about the CPR shortlined its St. Thomas Sub. and OSR leased it effective December 15, 2009. 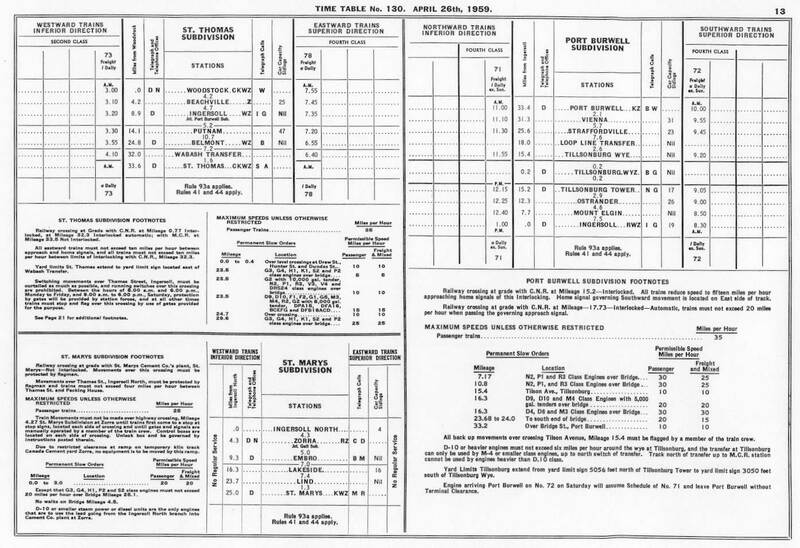 This gave OSR a direct connection with the CPR for its Port Burwell line as well as more traffic especially at Putnam.where two agricultural facilities receive considerable traffic. The biggest gain traffic wise was the large CAMI automotive assembly plant in Ingersoll which required another daily train. Later still CPR ended CN's access over its track to reach CAMI giving OSR exclusive switching of this growing plant. This requires two crews to switch CAMI two shifts seven days a week and interchange to/from CPR at Coakley via operating rights on the Galt Sub. Other traffic is handled in Woodstock yard where OSR also has running rights. Guelph and Tillsonburg lines along with photos of the CPR era.